Home » 5 ways to answer when my child asks why? 5 ways to answer when my child asks why? Children ask why because it gives them power. When my child asks WHY? I don’t dismiss it as attention deficit disorder. I have a list of responses to offer. But first, let’s admit the annoyance that comes with serial askers-why children: Louis C. K. offers the funniest reality on the challenges of having to answer the question WHY WHY WHY? “When I have a child I will answer all of their questions and open their minds to the wonders of the world. Well, guess what, you don’t know what the f— you are talking. You can’t answer the the kid’s question. They’ll never accept it!” – Louis C.K. 1. “Why what?” – Using this curt response has a very low success rate after the first few times of deflecting the child. To fail at a good answer when my child asks why means I am not providing the verbal attention he is craving, so in these cases I use the why what? strategy. It’s best to do this after bending over to the child’s eye level and engaging him or her directly with physical cues. This strategy serves to focus the child while requiring him or her to live up to his or her end of the bargain. By being able to repeat the question you will then know that he or she does, indeed, have a genuine curiosity to know the answer and not just wield power (although the two are not mutually exclusive). 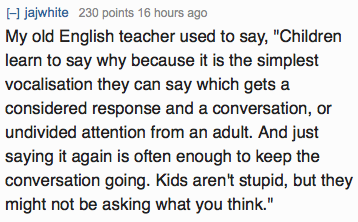 A recent post on reddit offered other ideas on how to answer a child when he or she asks why? 2. Research the question with the child – Empowering the child to find his or her own answer is always a good idea when you have the time and patience to do it. More times than not the thrill of the pursuit of knowledge can be mutually shared by experiencing how others are responding to the question. Google the question or type in the subject in YouTube to see if there are videos explaining how something works. Furthermore, it’s never too early to find an old-fashioned printed dictionary and teach reference skills. You might learn something, too. 3. Why do YOU think? – Although this response to a child’s question WHY is deflective in nature, it’s worth throwing it back to the child occasionally to confirm he or she is really curious about the topic and not just trolling for attention. That’s how you teach children to learn and think critically – reminding them that they are expected to deduce the answer for themselves sometimes. 4. Attempt Philosophy with the child – Richard Feynman demonstrates that any answer provided to a question is, fundamentally, unanswered. Because the framework of some underlying truth is impossible, there is no right answer and no end to the string of questions that would inevitably follow any attempted answer. 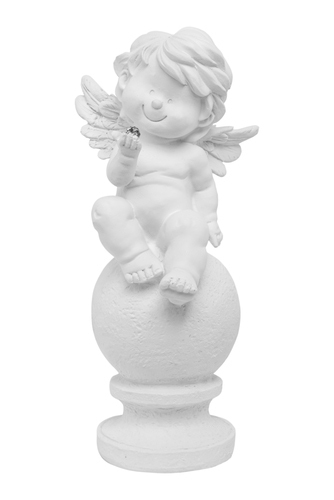 Only use this when you are at the end of the rope and willing to alienate the child for a little while. 5. Write down the question and send it to school – Sometimes, the answer when my child asks why is to defer to the experts and help my child write down the question to give to someone who is more knowledgeable on the subject. By providing a child with directions to ask others the answer, you can show that empowerment comes from going beyond their comfort zones. Yes, it can be a tax on the teachers, but here’s a good chance to show children that nobody has exclusivity on a subject. No doubt this method, if used too much, will not go over well with the teachers.